Looking summery and stylish when the temperature soars is a tricky feat to pull off. Suddenly exposed to a few sunrays after months of drizzle and cold, most of us look as though we’ve never encountered summer before. Apart from a handful of style icons like Alexa Chung and Natalie Portman, we haven’t got a clue what to wear during the summer months. I certainly haven’t. I’ve worn black tights till the end of July, horrified at the thought of exposing my pale legs. When I headed into London recently I looked around at my fellow commuters and realised I wasn’t the only one who didn’t have a clue. Some were in skimpy frocks more suited to Ibiza nightclubs, some had opted for those horrible flouncy skirts that don’t look good on anyone and a few were still buttoned up to the neck in winter outfits. Judging by this week’s pictures of David Cameron and George Osborne, it’s doubly hard for holidaying politicians. Forced to cast aside their slick city suits and polished brogues, their attempts to go into relaxed mode go horribly wrong. First the PM was snapped sipping cappuccino in a Tuscan café wearing wintery black loafers and no socks. Then the Chancellor was seen in LA sporting loose-fitting jeans, grey jacket and a very unchic red and black mini-rucksack. But the worst offenders in hot weather are the men who emerge in too-short shorts, open-toed sandals and beige socks (a combination that should have been thrown in the bin years ago) and pudding-basin sunhats that even David Beckham would be hard-pressed to look good in. The British as a nation, I reckon, are in need of an urgent summer makeover. PS: If, like me, you dream of escaping to a new life in France, do read Karen Wheeler’s accounts of her decision to hang up her high heels and move to rural Poitou-Charentes in western France. 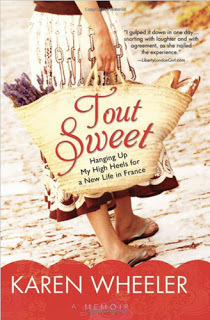 Or as she calls it, “the land of the long lunch.” When I reviewed her first book, Tout Sweet, a couple of years ago, I wrote: “I’m loving former fashion editor Karen Wheeler’s new book… If she can do it, I keep thinking, then so can I.” I still stand by every word. And today it’s being published in the US (the American cover is shown above), so I hope it sells stack-loads of copies. Harem pants sound very stylish!